Billed as Canon’s professional standard zoom lens, the EF24-70mm f/2.8L II USM replaces the popular full-frame EF 24-70mm f/2.8L USM model, introduced in 2002. The new lens was developed to address some of the shortcomings of the previous model and so features a redesigned optical configuration as well as a more durable outer barrel and zoom mechanism to maintain performance over its lifetime. Not only that, but the new lens features water-and-dustproof seals around the zoom and focus rings, switches, extending barrel and lens mount. As well as adopting UD glass, the lens features a Super UD element (with a performance close to that of fluorite) to moderate chromatic aberrations, while three aspherical elements improve peripheral sharpness and reduce the overall size. Despite the increase in filter size from 77mm to 82m, the lens is 10mm shorter than the now discontinued model, and, at 805g (28.39oz), the firm has reduced the weight by 145g (5.1oz) as well. The redesigned optical construction also eliminates the quirky handling of the previous model. Where the barrel used to extend when selecting the shorter focal lengths, the new lens behaves like one might expect, with the front barrel progressively lengthening at longer focal lengths. Although this lens appeals primarily to full frame (24x36mm) Canon users, it will still be of interest to those using an APS-C body, where the angle of view behaves like that of a 38-to-112mm. However, while the lens certainly sounds promising (Canon claims the image quality is vastly superior to the previous model), at around $2,500 it had better be good. As you might hope for with a $2,500 USD asking price, the second-generation EF24-70mm f/2.8L achieves an overall DxO Mark score of around 26 depending on the camera and the highest rating yet for a professional high-speed mid-range zoom. Looking at individual lens metric scores, the 16P-Mpix score for sharpness when mounted on the Canon EOS-1Ds Mk III is very good for this lens type, and comparable to a quality prime lens (although as we’ll see it can be equaled by the Sony-made Carl Zeiss equivalent). Zooms, even high quality types like this one may have some weaknesses such as some slight distortion, chromatic aberration or shading. However, Canon’s engineers have designed and built a lens to very high tolerances and the results are very good for a zoom of this type. Good sharpness (16P-Mpix), only equalled by the Sony Zeiss equivalent. 805g total weight (145g lighter than predecessor). Introduced in 2002 as the successor to the 28-70mm f/2.8, the first generation EF 24-70mm f/2.8L proved itself a very capable performer. Comparing the performance side-by-side the two share similar scores for distortion, vignetting and chromatic aberration (in fact the older lens was measured with slightly lower levels, though it’s unlikely to be noticeable in real-world use), however, significant advances have been made in sharpness (equating to a 33-percent improvement overall) and transmission values, down from T3.4 to T3.0. Both lenses are sharp in the centre but the improvement in the sharpness across the field accounts for the dramatic improvement. We’re also used to seeing the performance drop significantly at longer focal lengths, and, while it’s not quite at the same quality levels as the shorter lengths, it’s still noticeably better than the previous model. Zooming out a little to 50mm (again at maximum aperture) and the Mk II still shows a 5.5% improvement in acutance in the centre and 4% in the corner, although to be fair the older lens holds up well. At the longest focal length (70mm) and maintaining the f/2.8 maximum aperture setting, the shortcomings of the older version can be seen quite clearly. Direct comparisons reveal a 7.3% higher acutance in the center of the field, while the corner is an impressive 11% percent higher with the new lens over the first-gen model. As for transmission, the new lens is noticeable faster with a maximum of T3.0 and more closely resembles the f/2.8 theoretical aperture value. The graphs above reveal the relative differences between the two quite clearly (the red line plotting the results of the new lens, against the blue for the original version). Both lenses have the vaunted f/2.8 maximum aperture but our measurements reveal the new version is faster (brighter) by nearly a one ½ stop at 24mm dropping to just less than a one 1/3 stop brighter at 70mm. 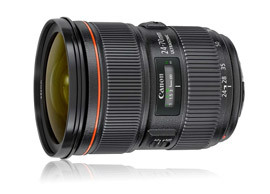 As a Canon user, potential purchasers of this lens will also likely consider the firm’s popular EF 24-105mm f/4L. Both are L-series and targeting professional photographers, however while the 24-70mm f/2.8 is one stop faster (theoretically), the 24-105mm f/4 has extra flexibility for portraits with the popular 85-105mm focal lengths, boasts image stabilization and at around $1000 less, is significantly more accessible in price. Not only does the EF 24-70mm f/2.8L II USM compare well against its predecessor, it also outperforms the 24-105mm f/4L in most areas when tested on the Canon EOS-1Ds MkIII. Not only is it significantly sharper and almost 1 2/3 stops faster, it has noticeable less distortion. However, not to be outdone, the 24-105mm f/4L has slightly less vignetting while also boasting quite low levels of chromatic aberration. A careful look at the DxO Mark Score Maps reveals the 24-70mm f/2.8 II USM to be a better performer optically than the 24-105mm f/4 at every aperture and focal length combination. However, in fairness, the performance of 24-105mm f/4 tails off more noticeably past the 70mm limit of the 24-70mm f/2.8 lens. If we compare the same focal range (as we should), the new lens outperforms the 24-105mm between the crucial f/4 and f/8 range but it also performs very well at f/2.8. If we take a closer look at the sharpness map for both lenses at a focal length of 50mm and at a comparable aperture (f/4 in this instance) we can begin to see the difference. Although one stop down from the maximum aperture, which is an advantage with most lenses, the new EF 24-70mm f/2.8L II USM delivers very good sharpness in the centre and that holds up well across the field into the corners. In contrast, the EF 24-105mm f/4L IS USM can only just about match the new lens in the centre, with the image noticeably softening towards the edges and corners. While this isn’t surprising given the fact lens performance is weakest wide-open, the results reflect the limited aperture choices and, therefore, typical use for photographers working in available light. Although the new EF 24-70mm f/2.8L II has two UD (ultra low dispersion) and one Super UD glass elements in the optical construction, in our global map the 24-70mm f2.8 has traces at every aperture and every focal length (though, unsurprisingly, it’s strongest at the faster apertures and wider end). By comparison, the simpler EF 24-105mm f/4L has much lower levels, and is only an issue at the wider end at the maximum aperture. If we examine the field map of the two lenses, we can see the lateral chromatic aberration actually doesn’t look quite as problematic as it it’s portrayed in the global map (above). Fortunately, lateral chromatic aberration is simple to remove in software (such as DxO’s own Optics Pro image workflow solution). While the Canon version is the latest to market, both Nikon and Sony users can call on relatively new designs. The Sony made Zeiss designed model is the oldest of the three and yet it has some very good scores, with each either bettering or matching the newer Nikon AF-S 24-70mm f/2.8 and, at first sight, rivaling the new Canon optic. While the Sony has slightly lower Distortion (at 0.3%) and Vignetting (at -1.4 EVs) than the Canon, the overall DxOMark scores of 26 vs 21 respectively are mainly influenced by the Canon’s uniform sharpness over the image field. This is noticeable at the wider apertures throughout the zoom range, and particularly at the longer focal lengths. The Canon also edges ahead with the impressive Transmission score. Field maps for all three lenses reveal the Canon’s superior sharpness across the frame, and although evident wide-open at its widest focal length, it’s more noticeable at longer focal lengths. With an DxOMark score of 26, the Canon EF 24-70mm f/2.8 MkII is the highest scoring professional fixed-aperture mid-range kit zoom of any brand in the DxO Mark database and comfortably outperforms rivals as well as the firm’s earlier Mark I version, particularly with regard to the sharpness levels across the frame. We’re used to seeing a noticeable deterioration in performance in the outer fields at longer focal lengths even with high-quality optics from the big-name marques but the new Canon bucks that trend. As for distortion and vignetting, it manages to hold its own against rivals even if it hasn’t quite managed to improve on those over the outgoing Mk I version. In spite of the complex optical construction, some chromatic aberration is visible in the corners that may require additional removal in post-production software but levels remain in line with the best of rival offerings. The main downside, however, is the very high price. At $2,500 the lens is far less accessible than the model it replaces, but the reduction in weight and size coupled with the boost in optical performance looks set to satisfy future demands from as yet unannounced high-resolution cameras. Although the priciest of those measured, the new Canon EF 24-70mm f/2.8L II USM reaches new heights of optical excellence in the professional mid-range, fixed aperture zoom category.